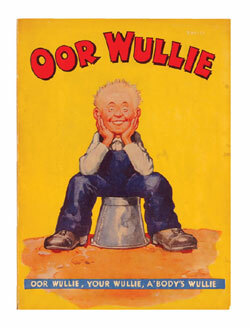 That cheeky wee lad on the upturned bucket has done it again; Oor Wullie gained a stunning £4405 for his first book in Fine + , the highest grade ever offered at auction. 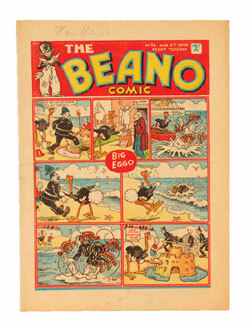 And just when we thought the Beano early issues had reached their high watermark at £200 each in our November 07 catalogue, five issues made £276 each, but as before in Very Fine grades. 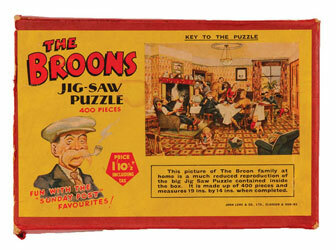 It is still a story of Oor Wullie and The Broons as Tea Time At Glebe Street made £552 and the rare jigsaw of The Broons At Hame found £440 (with a box flap and 29 pieces missing). 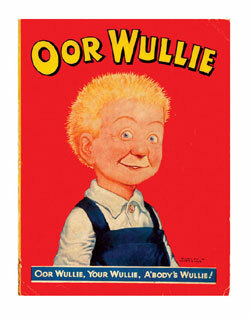 Wullie's Butter wouldn'ae Melt cover churned £661, and his Infinity Cover reached £608, all early 50s books now attracting very strong interest. 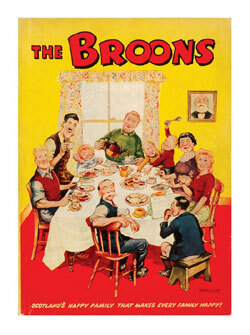 There will be some more in our June catalogue with a Broons Book 1 to lead the charge. 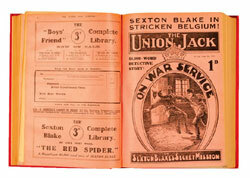 Our bound volume collection continues to sell well as The Union Jack, complete with Sexton Blake stories throughout and laced with WW1 propaganda, was raised to £385 for its complete year of 1916. That great detective's eponymous titles found £550 for 20 copies from 1920 and £880 for 38 copies from 1922, an average of £25 a copy. 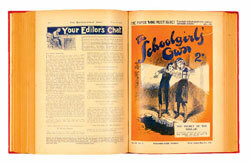 The Greyfriars Boys' Herald was also warmly received with Bunter and his chums, FA Cup stories and the early comic strip of Cheerful Clarence And Fat Fred finding favour at £280. 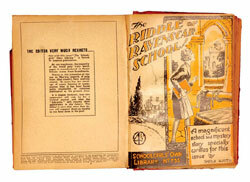 Our schoolgirls are beginning to show their muscles as Schoolgirls' Own and The School Girl complete year volumes from the 20s scored £220 each and Schoolgirls' Own Library from 1937-40 in 59 issues soared to £441, their new owner telling us she's happy to rebind some of the more worn and loose cloth covers. Top marks, girls. 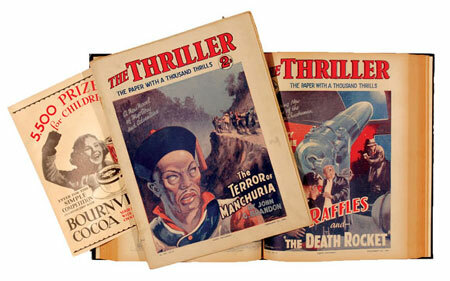 The Thriller was often the home for Leslie Charteris, John Creasy and Edgar Wallace to showcase their detective talents and these story papers' evocative covers magnificently highlighted the pot-boiling action within. 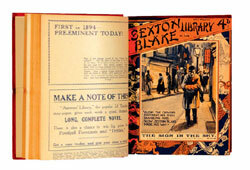 58 copies in a couple of bound volumes and some loose issues charted a crime-busting £462 and some more 1930s complete years will be offered in June. Australian reprints normally fetch up to £10 a copy depending on content and condition, but values in this area have been neglected for years and this may be about to change. 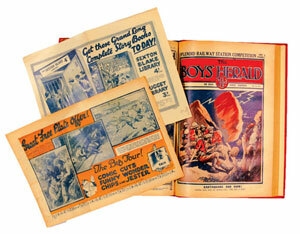 Illustrated above was a rare variant issue of the first reprint of Superman, but it lacked the 'No 1' on the front cover and had different stories inside from the original. We thought that this was a pre-publication issue to test the market at 6d and were only aware of one other copy like this in existence. 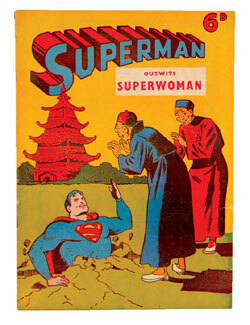 Our keen-eyed bidders thought so too and a kryptonic price of £253 was the winning bid, a record for an Oz reprint. 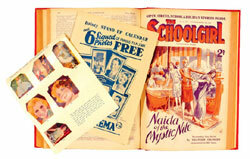 There's a further selection of some rare titles in our next auction in the summer. 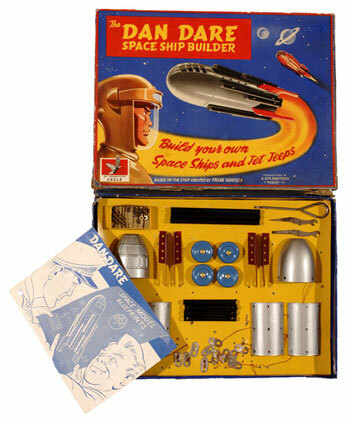 Talking of rarities The Dan Dare Spaceship Builder No 1 Construction Set is almost as hard to find, especially with most of its kit intact, and £385 has guaranteed weeks of unadulterated pleasure for the happy winning bidder who can now construct interplanetary spacecraft to his heart's content. 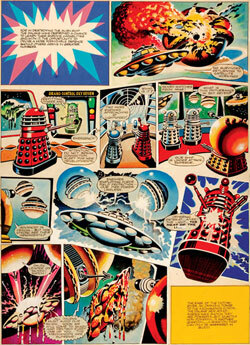 When informed of his success he said, " I'm over the moon.."
Our artwork sales increase steadily and Ron Turner's first Daleks work for TV21 No 50 was a key piece showing The Mechanoids deadly attack. 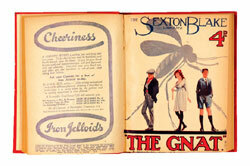 One determined American bidder doctored the opposition with an exterminating £1600. Frank Bellamy's artwork rarely appears at auction and his Garth signed cover from The 1976 Daily Mirror Book Of Garth was always going to strong-arm its £450-500 estimate where it finally pressed a heavyweight £990. Wham! 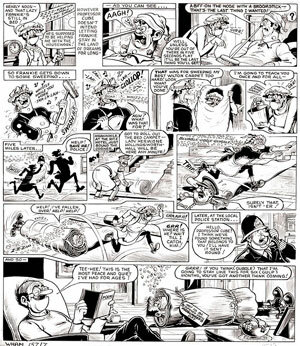 readers favourite, Frankie Stein was on of Ken Reid's masterful creations and his bolt-necked antics nearly drove Professor Cube to deconstruction (almost every week). The winning bidder bolted for £396. 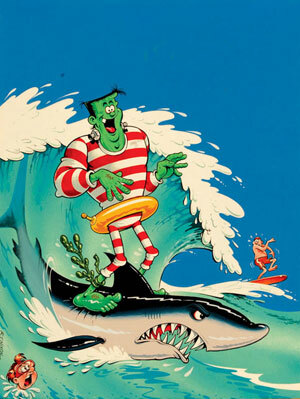 In the 1980s this mirthful monster was redrawn with great effect by Robert Nixon and a particularly endearing Summer Special cover of Frankie going shark-surfing was swallowed at £378, a record for 80s artwork in our catalogues. Our Us Golden age section offered some higher grade rarities but prices are softer in this area and perceived bargains can be found. 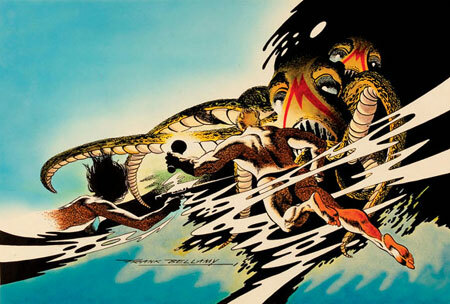 Slightly below estimate £85 and £108 were bid as Bruce Gentry went gently and Fight comics threw in the towel. In our Silver Age section key titles attract the most attention and X-Men, Avengers and a good run of Green Lantern all performed well. However, a CGC'd copy of Hulk 181 in '9.2' [nm-] grade failed to sell. 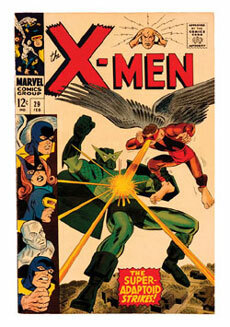 It appears that 9.4 and 9.6 are the grades that slabbed comics from the 70s are now wanted in. This seems to suggest that the comics incarceration business has now peaked if only the top 4 - 5% of the market is holding its price in this area. 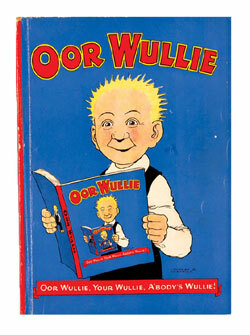 Rereading the above Market Report (I know, I know, I'm the only one…) got me to thinking about Oor Wullie, The Broons and Scotland in general (this wee lad was born in Glasgow). My Dad and his brothers used to have a warehouse in Sauchiehall Street where among other things they refurbished damaged war goods and sold them up and down the country to corner shops and general stores. I say 'sold', but many a deal was done by barter as money was just as scarce as basic commodities in those war weary years. I seem to remember being told that a dozen eggs was the going rate for a good torch with a spare battery. Twice a year my father would travel to the Isle Of Skye loaded up with two heavy suitcases for the only general store which was on the North shore. The ferry to Skye ran once in the morning and once in the afternoon and no cars were allowed on the island. The only bus went round a few times a day and the other vehicles consisted of a fire engine and a hearse, both driven by the same chap who ran the shop at the top. To my father's immense dismay he found himself on the morning ferry with a rival salesman, also bending under the weight of his cases of torches, candles, batteries, tins, dry goods and the like. The rivals waited disconsolately at the bus stop and after a while my father excused himself for a roll-up back at the terminal. The bus arrived and the rival boarded with glee as Mr Phillips had not returned. After half an hour's dark and bumpy journey his joy turned to misery when having entered the shop he was informed by the owner that, 'Yer too late, young Phullips has git here afore ye.' Distraught he waited all afternoon (probably in the pouring rain) for the bus to go back, only to come face to face with my father on the returning ferry. 'A dinna understand it', he said, 'You weren'ae on the bus, there are nae cars on the island, and the only thing I saw on the road wis a funeral. 'A wis drivin' the hearse,' my father replied.